With the development of my embroideries in ice, and my upcoming exhibition at Oriel Davies’ Testbed gallery, I have been exploring ways in which I might be able to slow, or even halt the melting of my embroidery. My initial experiments involved the adding of materials to the water before freezing to alter the temperature at which it freezes and thaws. At the small scale at which I am working this additions to the water had a fairly negligible impact and only slowed the melt for a matter of minutes. The next step in my process has been to try and affect the environment in which the works are exhibited rather than alter the substance of the work itself. I’m attempting this by using Peltier elements which produce a thermoelectric effect that can be harnessed – to a point – for heating or cooling. When a voltage is applied to the Peltier a temperature difference is created between the surfaces of the element. 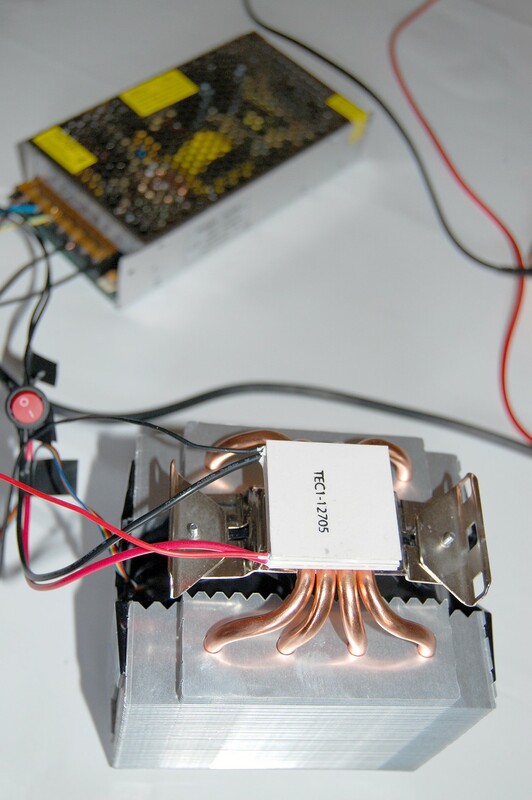 In order to use the Peltier element for cooling I need to extract the as much heat away from the hot side of the element – the cooler the hot side of the element becomes, the colder still the cold side will get. I’ve been attempting to do this by stacking the element on top of a heatsink as pictured here. The plan I have is to bring the Peltier element down to a cold enough temperature to chill an aluminium plate that will sit on top of a plinth. The embroidered ice will then sit on top of that aluminium plate. It sounds simple enough in theory but in practice it is quite a challenge extracting enough heat from the Peltier. One of the difficulties I am encountering is the properties of hot air – that is, that it rises! 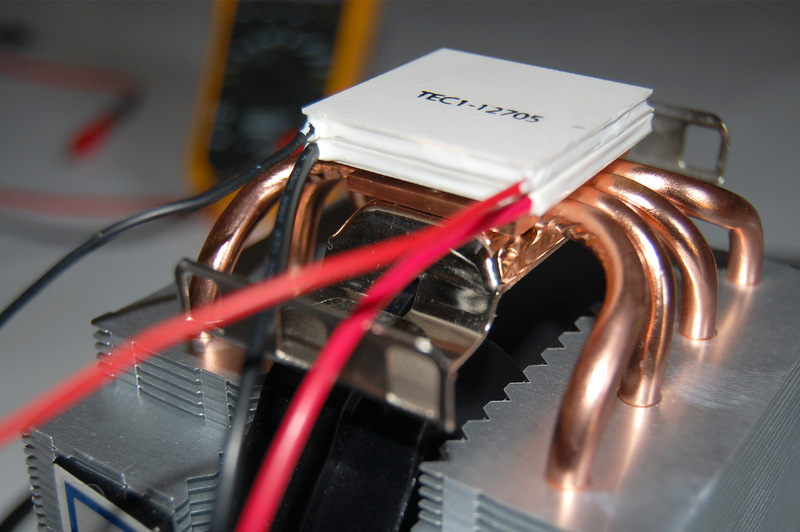 Heatsinks like this that I’m using are designed to cool CPUs in desktop PCs. As such they would normally be positioned upturned on top of the CPU – effectively I’m using it upside down. The problem with this is that the cold plate will be on top of the heatsink with warm air rising beneath it. I’ll need to consider ways to insulate the metal plate from the warm air rising. Another problem I’ll encounter will be the temperature of the ambient air surrounding the embroidered ice. If the work is only being chilled from beneath the work might still melt from the top down. I’m considering ways in which to try and cool the air surrounding the work which might involve the use of an additional Peltier TEC and heatsink. This would be massively inefficient though. Ideally I would create a closed system that would house the embroidered ice, perhaps screened behind perspex, but this does pose the possibility of producing large amounts of condensation which would obscure the work after a short period. Trying to work in ice is difficult enough – exhibiting it is providing some really fascinating challenges and considerations! If you have any pearls of wisdom to offer with regards to this please feel free to leave a comment or Tweet me!.